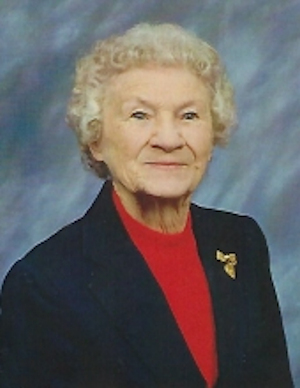 Obituary – Schwartz, Maxine Doris (Studebaker) « Perry High School Alumni Association, Inc.
Maxine Doris (Studebaker) Schwartz was born on October 1, 1917 to Cherokee Strip Pioneers Benjamin and Laura (Hollinger) Studebaker. She died on March 30, 2018 at Perry Green Valley Nursing Center. She was the youngest of seven children born on the Studebaker claim 2 miles south of Perry. Maxine lost both parents by age 7 and was raised by her only sister and brother in law, Ruth and Roy Friend. Maxine attended Fairview and Lone Star rural schools. She lived with the Woolard family in Perry while attending high school. She was a member of the Perry Honor Society and won awards for her vocal skills. After high school, she briefly attended Central State Normal School in Edmond. Returning home, she married John Bernard Schwartz on March 26, 1938. To this marriage was born 3 children, John Dwayne (Helen) Schwartz of Broken Arrow, OK, Janet Sue (Jim) Mortimer of Proctor, OK, and Carol Jean (Dennis) Steichen of Perry. Maxine was an excellent cook and baker. The grandchildren remember many Christmas cookie parties and her angel food cakes. She was an expert quilter and spent many happy hours with the First Christian Church Quilting Guild. She was baptized at an early age into the First Christian Church which became of utmost importance in her life. She was an active member until her death. She worked at the Perry Junior High School cafeteria for 17 years, a job she loved. Maxine was a loving wife and grandmother. Her happiest moments were time spent with her family. Maxine was preceded in death by her husband Bernard, her parents, two grandchildren, John Michael Schwartz, Troy Schwartz, and a great granddaughter, Christy Schwartz. Also her siblings, Ralph Studebaker, Ruth Friend, Roy Studebaker, Alvin Studebaker, Marvin Studebaker, and Earl Studebaker. Her nephews, Vern Friend, Glenn Friend and Ron Friend also went before her. Surviving her are her 3 children. Also 7 grandchildren, Mark Schwartz of Tulsa, OK, Daniel (Amy) Schwartz of Broken Arrow, OK, Jamey (Eric) Fox, Tulsa, OK, Jill (Daren) Hayes, Piedmont, OK, Jody Cardwell, Oklahoma City, OK, Jeff (Marylynn) Steichen of Wichita, KS, and Mitch Steichen of Chicago, IL. Also 13 great-grandchildren and 5 great-great-grandchildren. A public memorial to celebrate Maxine’s long life will be held on Saturday, July 7 at 11 am at the First Christian Church in Perry.